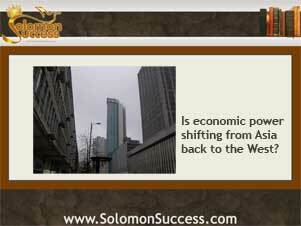 King Solomon was no stranger to international trade. His connections with neighboring rulers brought prosperity and resources to his kingdom, and supported the building of his great Temple. But as the Book of Kings tells us, changing political conditions could shift those connections from peace to war and vice versa. And today, economists are also keeping an eye on the changing landscape of economic power, as Western economic clout appears to be overtaking Asian dominance in investing and development. In the years following the US housing collapse and struggling economic times, China became the leader in Asian economic power, committing massive resources to development at home and investment abroad. The Bank of China became the leading foreign investor in US commercial real estate, and other established and emerging countries such as Japan, South Korea and Indonesia also began to flex economic muscle at home and abroad. While all that was going on, European countries struggled. The much-publicized troubles of Greece and Spain led a long list of economically depressed countries in and out of the European Union. Across the ocean, too, the US continued to battle a sluggish economy, slow job growth and a shaky housing market propped up by government stimulus plans. But as Business Insider reports, the latest PMI (Purchasing Manager Index) figures – a set of data indicating private sector economic activity – suggest that the growth of Asian economies may be slowing down. According to the same index, Western economics – Europe and the US – seem to be on the upswing. Why the shift? Economists cite factors ranting from natural cycles of growth and slowing in the global economy, as well as changing domestic conditions that make continued growth hard to sustain. And in the West, the US economy has found ways to overcome some of the issues connected with the housing collapse, with new growth in the housing market and a brighter employment picture. If it continues, this shift in economic clout could change the picture of foreign investing in the US. The recent upswing in Asian investment in US commercial and residential real estate would taper off, and China’s clout as a power in foreign investing could fade, leaving major projects unfinished or in search of new capital from elsewhere. But historically, foreign investment in US real estate has also included buyers from Canada, India and European countries, especially Great Britain and Spain. As those economies continue to strengthen, expect more capital from those sources to fill in the gaps left by waning Asian involvement in the markets. Weisenthal, Joe. “The West is on the Rise.” Business Insider. BusinessInesider.com. 1 Aug 2013. What Does the Fed Mean to You? Can Chinese Investment Boost US Housing?